This masculine birthday card is for my husband, Scott. Honestly, he really isn’t either a tool or car guy but I love these modern patterns and the variety offered in the Classic Garage 6 x 6 Designer Series Paper. The Well Said Cling Stamp Set and Well Written Framelits Dies were used for the “birthday hooray” sentiment and are on the list of My Favorite Things from the Stampin’ Up! Occasions Catalog. Well Said Bundle – Images © Stampin’ Up! Adhere a 4 1/4 x 5 1/2 piece of Basic Gray Classic Garage 6×6 Designer Series Paper to the card base with Snail Adhesive. Create a diagonal cut on a 4 1/4 wide piece of Whisper White Thick card stock by marking the left side at 1 3/8 and the right side at 2 1/2. Line up the marks within the ruler of a Stampin’ Trimmer and cut. Zip through the Big Shot using a Magnetic Platform and “birthday” die from Well Written Framelits. Be sure to keep ALL pieces. Adhere to a piece of Pumpkin Pie card stock with Snail Adhesive. TIP: I used the Take a Pick Tool to pick up the loose die bits from “birthday.” With the die bits still on the Take a Pick Tool, I lightly dabbed the back on the top of my Multipurpose Liquid Glue and adhered them to the negative space. 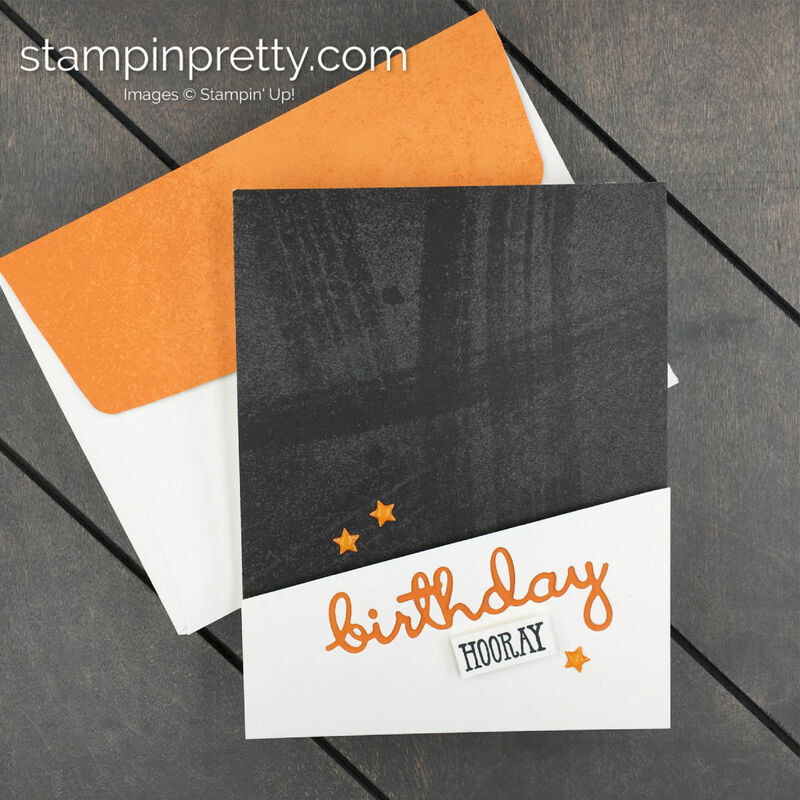 This gives a more defined look to “birthday.” Watch this Stampin’ Up! video demonstration on how the Take a Pick Tool works. Use the Stamparatus to stamp the “HOORAY” sentiment (Well Said Stamp Set) in Tuxedo Black Memento Ink onto a piece of Whisper White card stock. Snip closely with Paper Snips. Adhere below “birthday” with two Mini Stampin’ Dimensionals. Add three Mango Melody self-adhesive stars from Best Route Enamel Dots. Use the Stamparatus to position and stamp the sentiment (Well Said Stamp Set) in Tuxedo Black Memento Ink onto the inside of the card. Adhere a 2 1/4 x 5 3/4 piece of Pumpkin Pie Classic Garage 6×6 Designer Series Paper to the outside flap of a Medium Whisper White Envelope. Trim to size with Paper Snips. Today’s birthday card was inspired by Maile Belles’ congrats card shown above! Orders of $50 up to $150 (total before shipping and tax) MUST include the host code BELOW in their order for their tulips to qualify. MY FEBRUARY HOST CODE EXPIRES FEBRUARY 28. You’ll also earn Sale-A-Bration product rewards for every $50 or $100 you spend. Details here. 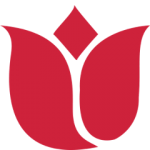 Submit your qualifying tulip orders and choices for your $50 shopping spree by clicking this form here or email me. EASY WAY TO REMEMBER TO ADD MY HOST CODE: Add my monthly host code to ANY order you place through me up to $150 (total before shipping and tax). Do not add the code on orders of $150 or more (total before shipping and tax). What if I forget to add the host code? Email me at [email protected] by the last business day of the month in which you ordered and I’ll do my best (I cannot guarantee this) to get the host code added to your order before the host code expires. Unfortunately, after the host code expires the last day of the month, I can no longer add it. Happy Tails Bundle Blog Candy Winner! Such a great card, Mary! I love how you let this understated paper steal the show on this card. Happy birthday to Scott! His birthday is today and I will pass your birthday wishes along! I agree with Kadie!! Plus you are just awesome when it comes to creating simple but WOW cards! Thanks, Tonya. Clean and simple with a little WOW! is my goal! I use the Stamparatus for 99% of my stamping. I consider it my multi-purpose clear block. I rarely use individual clear blocks anymore. If a stamp (including the “hooray” sentiment) doesn’t stamp evenly the first time, I have a second chance (vs. starting over). I like that kind of stamping confidence! Great card my friend. Shows us you don’t need it all to make a great looking card. TFS!!!!! I think it would have been easier to just cut the Pumpkin Pie die cut and layer it on top – live and learn!